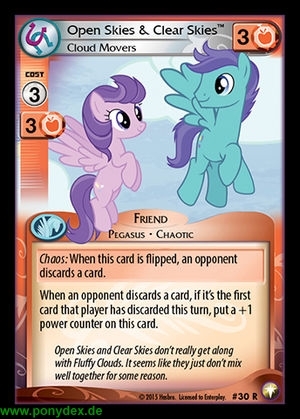 Chaos: When this card is flipped, an opponent discards a card. When an opponent discards a card, if it's the first card that player has discarded this turn, put a +1 power counter on this card. Open Skies and Clear Skies don't really get along with Fluffy Clouds. It seems like they just don't mix well together for some reason.